Wes Anderson films inspire a groundswell of apathy from me. Often his work feels like Jazz to me, a form of art given much credit, even though few people understand it. If it’s “good” or not would seem to be in the eye of the beholder, but one must insist at the very least that some of his films are better than others. For me, the good ones thus far have been The Aquatic Life with Steve Zissou, Fantastic Mr. Fox, and finally, this, his best film. There are many reasons for this, but the primary one is the story. Anderson’s films are the definition of quirk. Odd characters, interesting perspectives, effects that look intentionally fake, but somewhat fascinating. If there is a vehicle to pull it all together, the effect can be pretty good. Or in this case, classic. His last effort, Moonrise Kingdom was just dumb. Everyone in that story was no one to care about. In truth, they all seemed like mental patients. As a result, the odd aspects were annoying at best, frustrating on average and unwatchable at their worst. 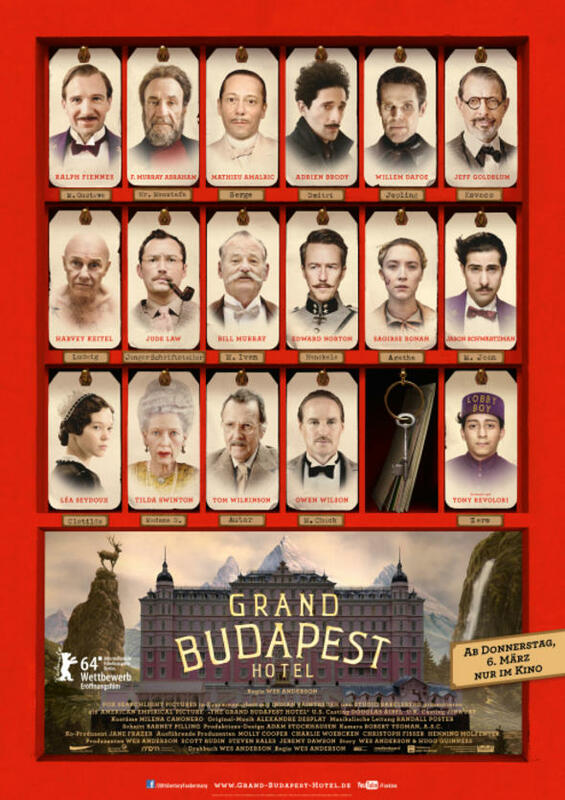 The Grand Budapest Hotel escapes this fate by giving its characters very clearly defined objectives, and then setting about the goals with wonderful precision. The focus of the story, Monsieur Gustave H. (Fiennes), devoted concierge of the titular hotel and his lead lobby boy, Zero (Revolori). Their friendship for each other is immediate, and soon Gustave is giving Zero the best training possible. Outside the realm of this training, Gustave has relationships with several of the elder lady patrons of the establishment. One of them (Swinton) dies, leaving Gustave a painting in her will. The painting has something attached to it that is of great import to the rest of the story. Other relatives of the deceased, particularly her son, Taxis, arrange to have Gustave framed for the murder of his mother. That he did not do it is obvious, but his arrest sets off a chain of events that leads Inspector Henkels hither and yon, while Gustave and Zero race to uncover the truth. Fiennes is magnificent in a role that allows him to rise above the limits of the script. When things get ridiculous, like the scene in the mountain monastery, we see him explode with the frustration the viewer experiences as the joke goes too far. Then, almost immediately, his hits another comedic note. My friend WeMissE thinks that Fiennes deserves a rare best actor nod for a comedy, and I am inclined to agree with him. Equally fascinating is Revolori, as the devoted, confident and resourceful young Zero. His relationship with Gustave exists on many levels, and watching them break through those levels is a charming and rewarding experience. Additionally, his courtship of Agatha. Many moments ring true for two people seemingly destined for one another. The best scenes in the film use miniatures. The trolleys and the buildings are comical and fascinating to look at. The chase from the monastery down the mountain is delightful and gives an exhilaration that would be missing if they had poured James Bond style money into it. For those who’ve kept Anderson at arm’s length, I understand your trepidation. If you are ever going to give another of his films a try, let this be the one. Who knows where he’ll go in the future, and if I am judging by his past work, I am not likely to care. This is a movie that I will watch again and again, however. Try it once.